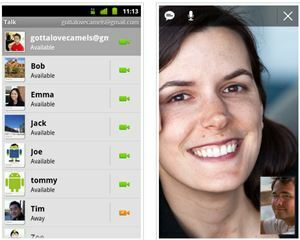 Google Talk is an instant messaging, audio and video chat service from Google, which is being designed for users to communicate in real time with other users who also use Google Talk. To complement Google Talk on desktop computer, Google has recently expanded Google Talk to Android phones with video and voice chat. With the new added service to Android phone, the users can now make a video or voice chat with their friends, family and colleagues who also use Google Talk on Android devices or on desktop PC. Able to make calls over 3G or 4G data network (if your carrier supports it) or over Wi-Fi. Simply touch the video or voice chat button to connect with the friends or family members who are in the Google Talk friends list. Text-chats will be overlaid on the phone screen while you are on video with others. The video will automatically pauses and audio will keep going when you need to check something else from the Home screen or apps. Google Talk with video and voice chat has already started to delivered to Google Nexus S devices as part of the Android 2.3.4 over-the-air update. Other Android devices will have to wait until the phone manufacturers such as HTC, Samsung, Motorola, LG and etc to start offering upgrade to Android 2.3.4 for their respective phones in order to get Google Talk with video and voice call feature. If you can’t wait for the Google Talk with video chat support to come to your phone, which may take weeks or months to arrive, a hacker named britso has managed to extract Google Talk 1.3 app with video plus voice call support from Google Nexus S Android 2.3.4 update, hack the SigninActivity.smali to comment out a line so that the app works on other devices. The app is then re-compiled and pushed as the APK file for installing into other Android mobile phones running Android 2.3 or above. Listed below are several ways on how to instal lGoogle Talk with voice and video chat support onto your Android smartphone. Note that the hack only works on rooted Android phone. The download links of Google Talk apk is available from xda-developers.com (registration required). Download either Talk_with AV.zip or Talk_with_AV_no_wifi.zip. Run Talk and press on your own name where you can change your own status and tick the Allow video and voice chats to enable the feature. Download and extract Talk_with AV.zip to SC card. Open Root Explorer and navigate to extracted files on SDcard. Copy talk2.apk and go to /system/app. Press Mount R/W at the top right and then press Paste on the bottom left. Now you have both talk.apk and talk2.apk. Now press and hold on Talk2.apk and press Rename. And rename Talk2.apk to Talk.apk. Go back to extracted files SDcard and copy libtalk_jni.so. Open Talk and press on your own name where you can change your own status and tick the Allow video and voice chats to enable the feature. Backup Talk.apk in case you want to go back to original version or encounter error. Download talk1.3.nowifi.update-signed.zip which works on CM7. Note that video chat may not work for most non-Google Nexus S phones. Some users have reported that installing “GoogleServicesFramework.apk” from the Google Apps Pack after version 20110503. However, the workaround does not work on all models.